Aksharadhool: A Great Job Indeed! In an earlier blogpost I had narrated the story, in which I had mentioned how Indian Government's, Ministry of environment and forests, were bent upon not publishing Prof. Madhav Gadgil committee's report on Western Ghat mountains ecology, in spite of clear cut instructions from Central information commissioner. The ministry had then appealed to the Delhi High court against CIC's orders. The high court has however rejected the appeal and has withheld the order of the CIC and has directed the ministry to immediately publish the report. This report has been now published by the ministry on its website. The report is huge, contains 522 pages and is highly technical. Luckily, there is a summary given in the beginning. From the summary and also a quick browsing through, one can realize that Prof. Madhav Gadgil committee has done an exhaustively through investigation of the present situation all along the Western Ghat Mountains and have given concrete recommendations for steps that should be taken by the Government. I am not much of an expert in these matters. Even then, with my almost cursory or rudimentary knowledge of the situation, I can clearly see that Prof. Gadgil's committee report is likely to ruffle many a feathers or putting it more strongly, is likely to trample on interests of many bigwigs. The chances of this report being adopted by the Government therefore appear rather dim. However, this report is a must read, for those who love western Ghat mountains. Let us first see the major recommendations of this committee. 1. No new dams based on large scale storage be permitted in Ecologically Sensitive Zone 1 as defined by the Panel. Since both the Athirappilly and Gundia hydel project sites fall in Ecologically Sensitive Zone 1, these projects should not be accorded environmental clearance. 2. For the state of Goa, an indefinite moratorium on new environmental clearances for mining in Ecologically Sensitive Zones 1 and 2, a phasing out of mining in Ecologically Sensitive Zone 1 by 2016 and continuation of existing mining in Ecologically Sensitive Zone 2 under strict regulation with an effective system of social audit. 3. Current moratorium on new environmental clearances for mining, polluting industries and power plants in the plains and coastal tracts of Ratnagiri and Sindhudurg districts should be extended till satisfactory completion of a Carrying Capacity analysis for these districts. 4. Genetically modified crops should not be allowed. 6. Land use For all settlements and built areas/ to be developed areas, certain types of areas would be no-go areas, including water courses, water bodies, special habitats, geological formations, biodiversity rich areas, and sacred groves. 7. Special Economic Zones (SEZ) should not be permitted. 4. No new licenses to be given for mining Where mining exists, it should be phased out in 5 years, by 2016 Detailed plans for environmental and social rehabilitation of mines to be closed. Besides these, there are many other recommendation and it would be a good idea to read the report in original. 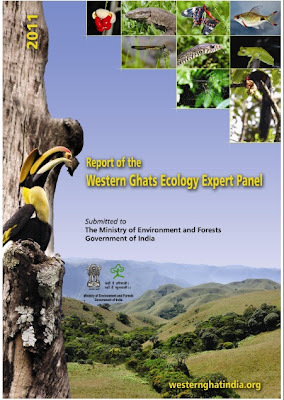 As I said in the beginning, this report is also an excellent study on ecology of this important region of India and suggests number of measures to save it for the future. The main difficulty for it's implementation is that it tramples just too many interests of big businesses and political bosses and that is why the ministry tried to withheld it as much as possible. In any case, Prof. Madhav Gadgil committee should be congratulated for a great job done for the Western Ghat mountains and India.